July 24, 2015 – Approaching the third anniversary of its landing on Mars, NASA’s Curiosity Mars rover has found a target unlike anything it has studied before — bedrock with surprisingly high levels of silica. Silica is a rock-forming compound containing silicon and oxygen, commonly found on Earth as quartz. 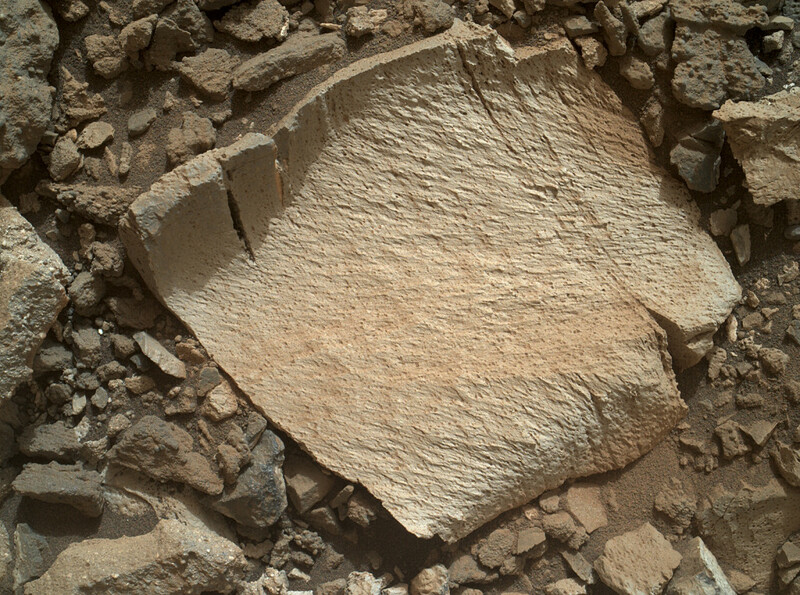 In fact, the Curiosity team decided to back up the rover 46 meters (151 feet) from the geological contact zone to investigate the high-silica target dubbed “Elk.” The decision was made after they analyzed data from two instruments, the laser-firing Chemistry & Camera (ChemCam) and Dynamic Albedo of Neutrons (DAN), which show elevated amounts of silicon and hydrogen, respectively. High levels of silica in the rock could indicate ideal conditions for preserving ancient organic material, if present, so the science team wants to take a closer look. “One never knows what to expect on Mars, but the Elk target was interesting enough to go back and investigate,” said Roger Wiens, the principal investigator of the ChemCam instrument from the Los Alamos National Laboratory in New Mexico. ChemCam is coming up on its 1,000th target, having already fired its laser more than 260,000 times since Curiosity landed on Mars August 6, 2012, Universal Time (evening of August 5, Pacific Time). In other news, an engineering test on the rover’s sample-collecting drill on July 18 is aiding analysis of intermittent short circuits in the drill’s percussion mechanism, in preparation for using the drill in the area where the rover has been working for the past two months. The latest test did not result in any short circuits, so the team plans to continue with more tests, performed on the science targets themselves. “We found an outcrop named Missoula where the two rock types came together, but it was quite small and close to the ground. We used the robotic arm to capture a dog’s-eye view with the MAHLI camera, getting our nose right in there,” said Ashwin Vasavada, the mission’s project scientist at NASA’s Jet Propulsion Laboratory in Pasadena, California. MAHLI is short for Mars Hand Lens Imager. The rover had moved on before the Elk data were analyzed, so a U-turn was required to obtain more data. Upon its return, the rover was able to study a similar target, “Lamoose,” up close with the MAHLI camera and the arm-mounted Alpha Particle X-ray Spectrometer (APXS). The U.S. Department of Energy’s Los Alamos National Laboratory developed ChemCam in partnership with scientists and engineers funded by the French national space agency. Russia’s space agency provided Curiosity’s DAN instrument. JPL, a division of the California Institute of Technology in Pasadena, built the rover and manages the project for NASA’s Science Mission Directorate in Washington. The Curiosity Rover launched on a United Launch Alliance Atlas V rocket on November 26, 2011. The aeroshell, comprised of a heat shield and back shell, was designed and built by Lockheed Martin. The Southwest Research Institute in Boulder developed the Radiation Assessment Detector (RAD), one of 10 science instruments that collect data on the rover.